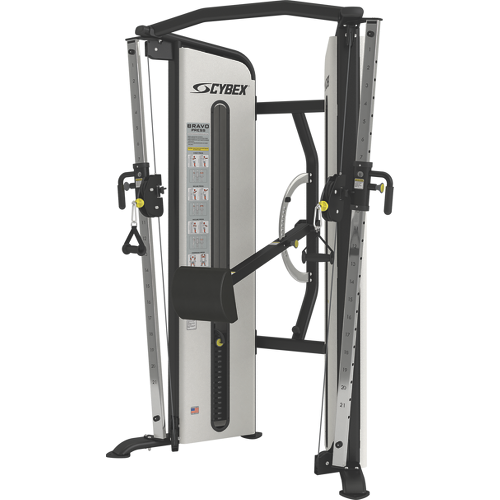 The Cybex Bravo Press offers the Bravo progressive stabilization system and pressing functionality, with fast and easy setup.The Cybex Bravo Press has the Progressive Stabilization system found on the Bravo functional trainer. It also shares adjusting tubes with the Bravo, but those found on the Cybex Bravo Press are not vertical, as they are on the Bravo, and they’re slightly angled to form greater width at the top. These two features allow the same pressing functionality found on the Bravo, but in a much simpler form. Due to the Cybex Bravo Press is only used for pressing movements, less fore/aft adjustment is required in the Progressive Stabilization system, thus requiring adjustment only for height.